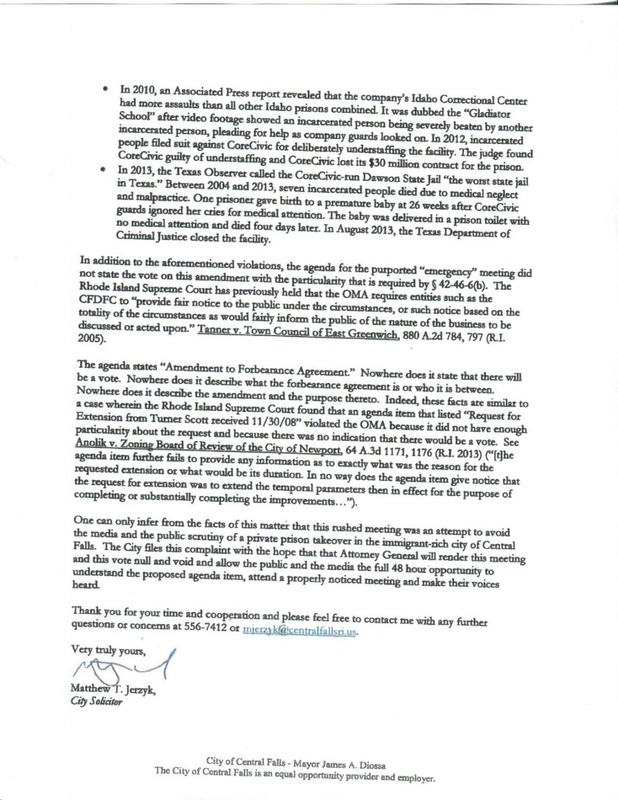 Citing a long history of problems, the City Council and the Mayor stand united in their resolve to close down Wyatt Detention Center for good. 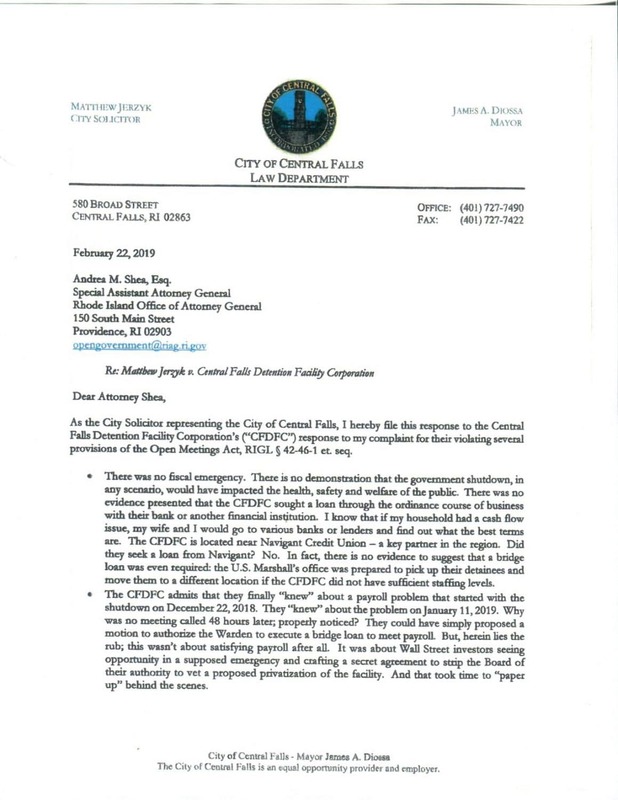 Central Falls Mayor James Diossa blasted Wyatt Detention Center management over the deal the facility struck with United States Immigration and Customs Enforcement (ICE). 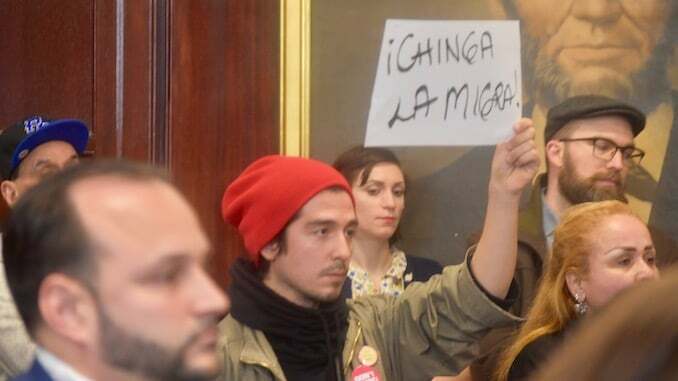 Last Friday the Rhode Island ACLU revealed that the facility is holding more than 100 ICE detainees and that there is a contract with ICE to hold up to 225 detainees. 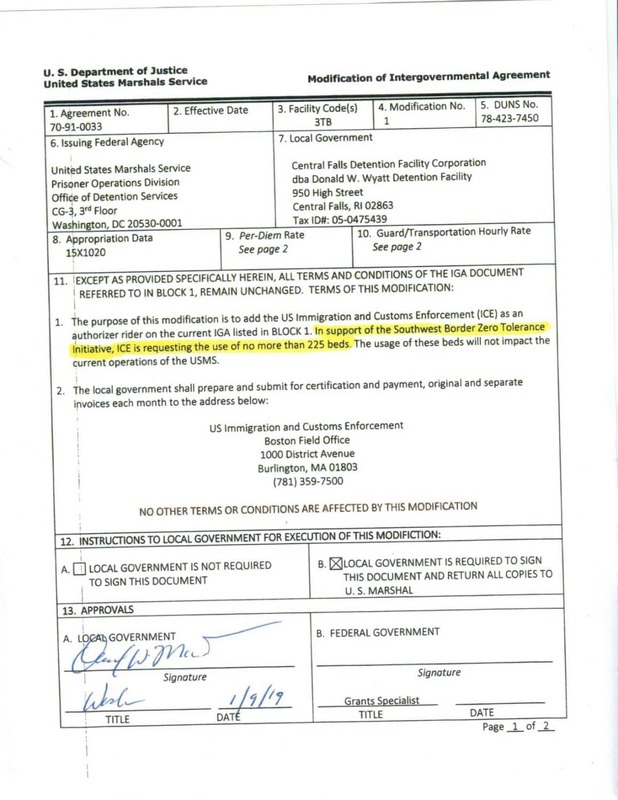 According to the contract, ICE needs the beds at Wyatt “in support of the Southwest Border Zero Tolerance initiative.” This policy, rolled out by former United States Attorney General Jefferson Sessions in April 2018, “prohibits both attempted illegal entry and illegal entry into the United States by an alien.” In other words, people who have committed no crimes except to travel to the United States without documentation. 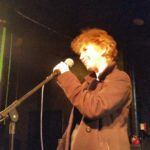 In his comments at the emergency City Council meeting Thursday evening, Diossa said that there is a “big difference between immigration detainees who were at Wyatt previously and this new Trump initiative.” The initiative, “set into motion the systematic – and as we have since learned, chaotic – separation of children from their parent,” said Diossa. 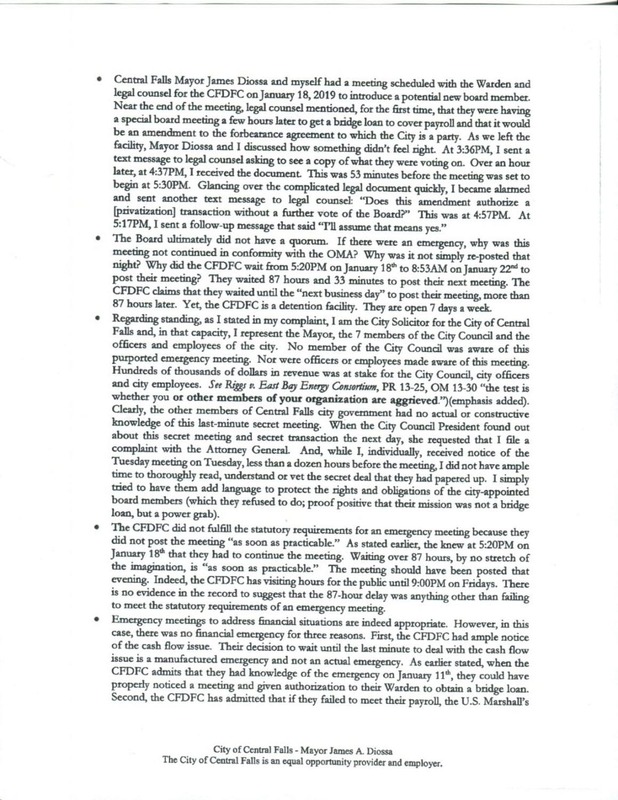 The complaint requests that the meeting and the votes taken therein to be ruled null and void. 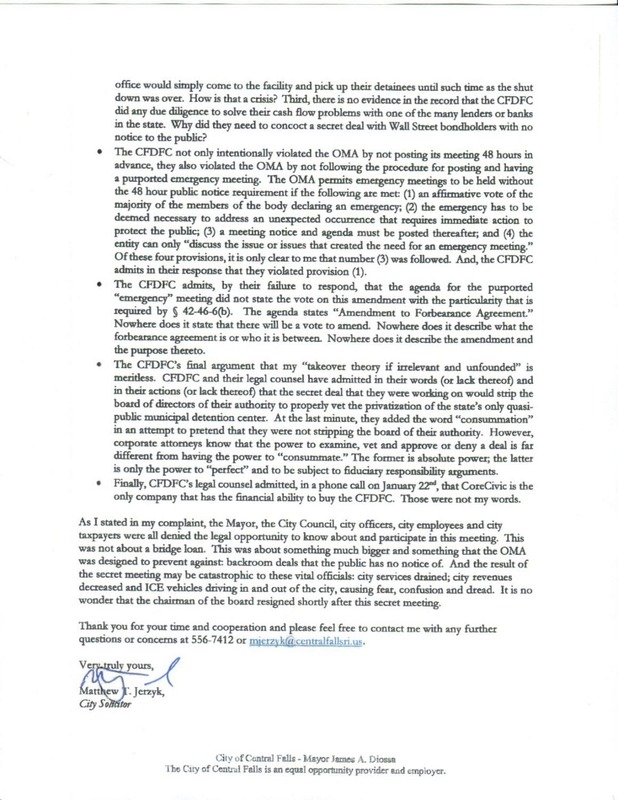 During the improperly noticed meeting, the CFDFC voted to approve “a secretly negotiated amendment to a forbearance agreement to which the City was a party to… Section 3 of the amendment creates a roadmap for the bondholders to seize control of the corporation’s board and to sell the CFDFC to a private prison corporation such as CoreCivic (formerly Corrections Corporation of America), whose names appears in the amendment,” writes Jerzyk. 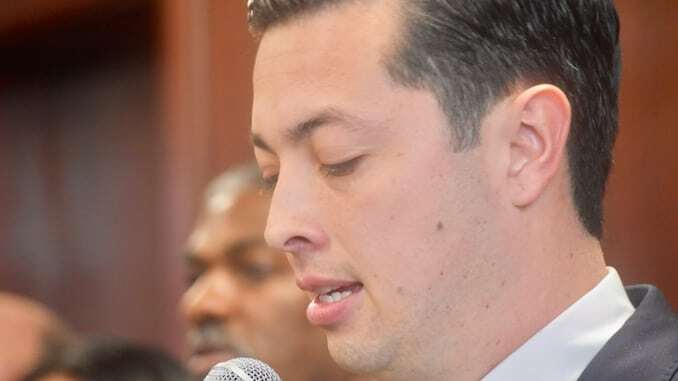 “I trust that the AG’s office will find that, in fact, the meeting was held in violation of state Open Meetings law, therefore nullifying the votes taken during that meeting,” said Diossa. 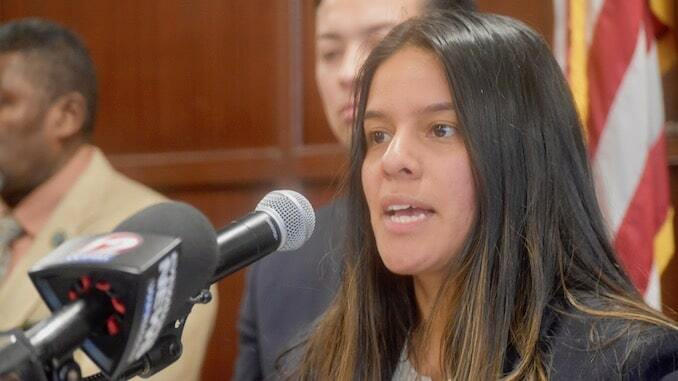 “Today we will stand together and fight to get this detention center out of our city and even more so, to stop the detention of immigrants at the Wyatt Detention Center,” said City Council President Maria Rivera (at large). 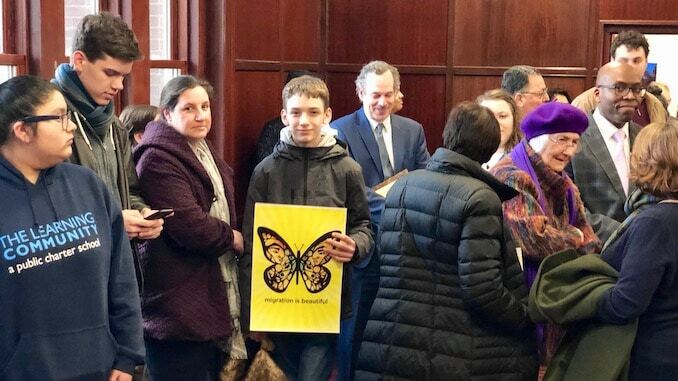 She was standing with fellow City Councilors Jessica Vega (Ward 5), Jonathan Acosta (Ward 1), Hugo Figueroa (Ward 3) and Franklin Solano (Ward 4), as well as State Representative Shelby Maldonado (Democrat, District 56, Central Falls). City Councilors Robert Ferri (Ward 2) and Agostinho Silva (at large) were not standing with Rivera. Silva is City Council President Pro Tempore and a member of the Wyatt Detention Center Board of Directors. Representative Maldonado talked about playing soccer in the field across the street from the detention center as a high school student. 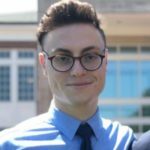 “So when teams came from across Rhode Island to play Central Falls High School students, that’s exactly what they looked at. 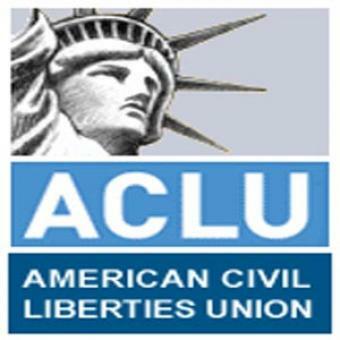 “In no shape or form is this administration okay with the detention center,” said Maldonado. “As of next week you will see a piece of policy in the General Assembly,” to address this issue. Central falls does not support the zero-tolerance initiative by Donald Trump. 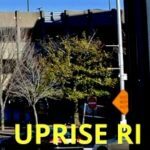 No Rhode Island community would accept an institution that did not make payments to the community. 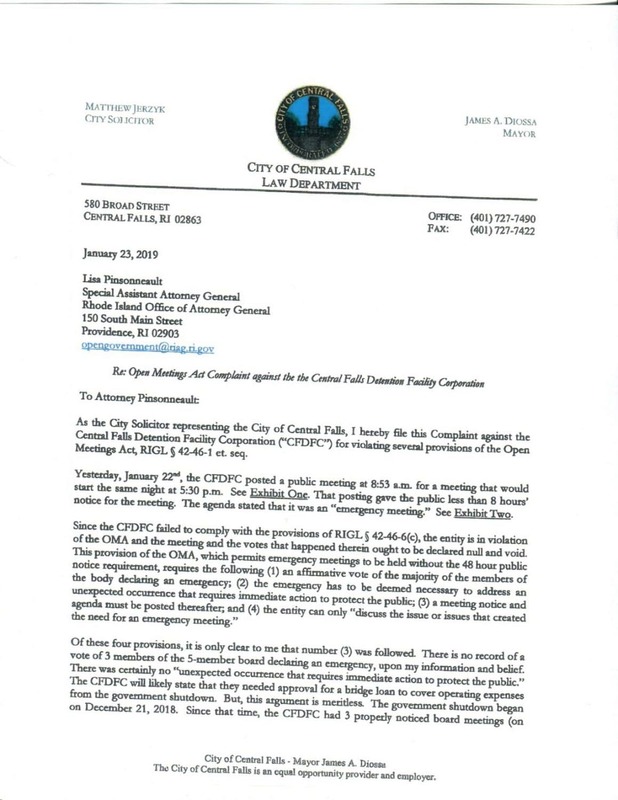 Former Central Falls Mayor Thomas Lazieh, who championed the Wyatt Detention Center project during his administration, attempted to engage with Diossa at the conclusion of the emergency meeting. Lazieh says he doesn’t support Trump’s immigration policies but he does support Wyatt. 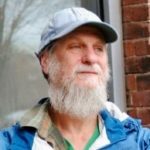 Lazieh told Channel 12 news that the Central Falls City Council was briefed on ICE’s interest in Wyatt as early as October of last year. 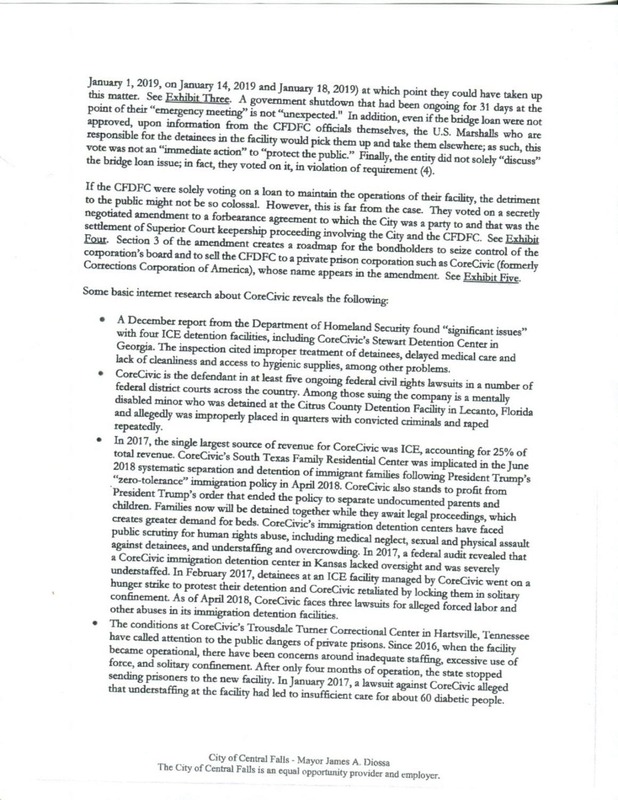 Minutes from a January 14 Wyatt Detention Center Board meeting show that the Board was aware of contract negotiations with ICE at that date. I asked Diossa about this during the question and answer session with reporters after the emergency meeting.